One of the problems with the underground cities where we'll live after the asteroid hits is that they can get a little boring. Always the same tunnels, the same rocky ceiling, and buildings that never move. But now a design group called Space Flavor has solved this problem before it starts with their incredible, mobile rooms for warehouse living. Called "the Cube," this lightweight structure contains a modest study, bedroom, and upstairs meditation area (which could easily be converted to a dining room). 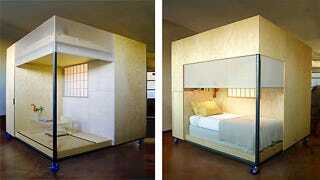 It was designed for a feng shui instructor who needed to use his warehouse for teaching big classes, as well as living. Now he can move his bedroom and study anywhere he wants, to make room for crowds or simply to create the best feng shui possible. Translucent roller shades, a shoji screen and frosted acrylic panels allow daylight to filter through the Cube, while responding to varying needs for privacy. At night the Cube illuminates like a lantern, casting playful shadows on the glowing screens. It's obvious how this would improve life in a post-apocalyptic underground city. You can move your rooms anywhere you want, reduce boredom, get new neighbors, and get used to the nomadic lifestyle you may need to embrace when you return topside. In the meantime, though, the Cube is a great way to make your warehouse more space efficient.